See also: Notebook hoarder, coffee snob and lover of fresh flowers... and cute comfy flats. My thing? Helping style savvy femmepreneurs get crystal-clear on the vision for their visuals, pin down a standout style and create gorgeous graphics with Canva so they can promote online with confidence. And, save time, save money and say #goodbye to brand shame forever! Whether you’re looking for done-for-you custom Canva creations or you just wanna learn the skills to DIY gorgeous graphics that don’t looked DIY’ed, I’ve got your back. Trust me, after almost a decade working my tail off in visual and style-oriented fields from food styling to home organizing, one thing I know for sure is that appearances matter. Just think about it: Your dream clients are indexing through hundreds of images a day. And the fact is, while our attention spans are decreasing, our visual IQ is actually increasing! Which means that the easiest and best way to stand out online and #STOPTHESCROLL is with your visuals. But not just any visuals, lovely. Visuals with a vision and a story. Visuals with a consistent and cohesive style. And visuals that are designed specifically to connect and convert. I get it. What busy biz babe has time to learn complicated software like Photoshop or InDesign? And can you really create the kind of high-quality, Pin-worthy images you find all over the Interwebz without spending thousands on a designer? That’s where I – and Canva – come in. Today, Canva is my secret weapon for creating images that keep my peeps (and my clients’) intrigued and invested. A few years ago, I was a stay-at-home (about-to-be-brand-new) mom and health coach with a serious case of brand shame. Everybody else online seemed to have it all figured out. They all had these beautiful, put-together spaces with gorgeous graphics that practically oozed personality. But I couldn’t seem to do the same no matter how hard I tried, even after hiring a fabulous designer friend to help me out. And while, I loved my stylish new site, I couldn’t recreate the fabulousness for my social media and other online spaces. I was frustrated, and annoyed, and this close to giving up on my biz dream altogether. Since then, Canva has quickly become my favorite online tool and business investment. It used to take me hours or even days to create one graphic that I thought was “okay.” Today, I can create new images in minutes. And let’s just say, my wallet looooves that the only designer I need in my life now is Michael Kors (okay, and Kate Spade). Seriously though, I no longer believe in brand shame – or that any female biz owner should have to pay someone else thousands of dollars for a website (and marketing materials) that they don’t feel good about or that they can’t recreate (with ease) themselves. That’s why no matter whether you work with me one-on-one to get the look you love or let me teach you how to DIY it in one of my courses, I’d LOVE to share ALL my secrets for creating a beautiful brand and digital home you’re proud to show off because it feels exactly like you and grows your profits, too. You’ve got the creativity and the eye for style. All you need now is a strategy and a tool to make it all happen. pin down a vision for your visuals and get to work on your "Visual Dream"? create your own personal, stand-out design style? learn how to build (and beautify) your marketing materials, biz templates and online spaces like a pro (over and over again, without the help of a designer)? Then allow me to show you the way, babe. Grab your fave gold striped notebook and dip into the FREE Canva Resource Library. We’d love if you joined the (pretty) party, babe. I was born left handed and now write with my right hand. In addition to my Canva and Biz Styling Course, I have a Home Styling Course too. You can get the Free Intro Course here. I lived in New York City for 3 years, before moving to Denver, CO.
My vices are (in order) chardonnay, coffee and chocolate... Who am I kidding? I was born in Cape Town, so I love all (quality) wines. My party trick is folding a chicken out of a dinner napkin. I KonMarie method my closet. I kinda have a thing for structure, beauty and organized spaces. I have a really cool Clever with Canva Facebook Group filled with amazing Femmepreneurs who want to create gorgeous images for their biz. Join us here. And? I also have an ebook called Eating for Energy, it's fab for femmepreneurs who forget to feed themselves in the day. Grab your copy here. 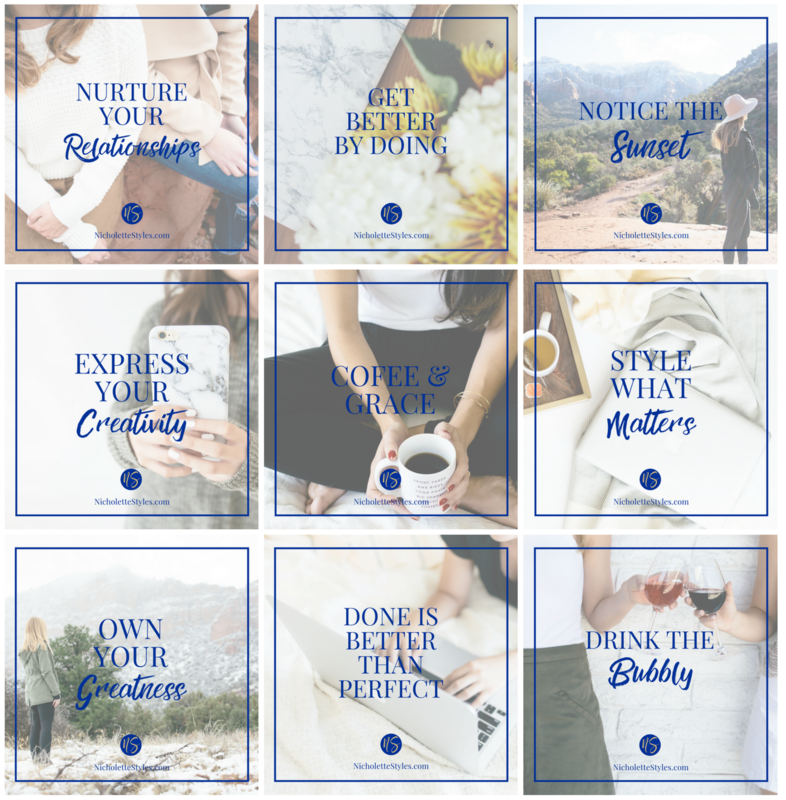 Nicholette Von Reiche is the go-to Canva Queen for creative, style-savvy femmepreneurs who want to DIY gorgeous graphics for their business that they can promote their own brands with confidence. Born in Cape Town, South Africa, Nicholette’s has had several fascinating past lives, including working as a Food Stylist, Personal Assistant, Event Coordinator, Health Coach and Home Stylist before bringing her talents online to teach (and do!) Canva Styling for female business owners. Needless to say, she knows a thing or two about what it takes to create beautiful spaces, places and experiences. When Nicholette’s not building her Clever with Canva Empire or creating Custom Canva Templates for clients, you can probably find her on a (hopefully scenic) patio with a glass of crisp white wine, restyling her scatter pillows or anthropology candles or building Magna tile mansions with her toddler, (super adorbable) Pomeranian and handsome husband. one Canva graphic at a time. Style is a form of expression. It’s a way to show the world what is most important to us. I want to help you create online spaces that are always ready for company. Spaces and visuals that flow better, function better and feel better to look at. I've had brand shame and the hot mess visuals and I've cringed whenever I've had to share my site and blog post in a Facebook group. I want to help you create a stand out style that's easy to recreate every time. Having spent almost a decade working in visual and style-oriented fields from food styling to home organizing, the one thing I know is that (the right) appearances matter. Your ideal client is indexing through hundreds of images a day, but she needs to know, feel and recognize your brand from the crowd. Whether you work with me 1:1, let me teach you to DIY through one of my courses, or free online events, together we can create a beautiful brand and digital home you’re proud to show off because it feels exactly like you, and effortlessly attracts your dream clients, too. You already have the creativity and the eye for style, all you need now is a strategy and a tool to make it happen.